So yay to free pattern! It was pretty simple and straight forward that I didn't really feel like charging $ for the pattern. So what the heck. Free is good. Everybody likes free stuff. All you need is a worsted weight yarn and #5(3.25mm) needle. Straight or circular doesn't matter, and gauge doesn't really matter either. Since I wanted to make a thin and breezy spring/summer scarf...or..scratch that. Actually it was the other way around...this pattern was born since I found this beautiful skein of Farmhouse Yarns Bonnie's Bamboo. Slick and shiny and slightly varied color. But you can use any other fiber--cotton, wool, aplaca, linen...anything you like. Row 1-5 is seed stitch. RS : K1P1..to the end. Should end with P1. WS : P1K1...to the end. Should end with K1. From here, we start the Grapevine Lace stitch with 3 rows of garter stitch border to prevent curling. This means the first 3 stitches and the last 3 stitches on both RS and WS are knit stitch. The borders are included here, so don't worry about counting them, just follow what's here..
Row 2, 4, 6, 8, 10, 12 - K3, P until the last 3st, K3. All you need to do is repeat those 12 rows until desired length. After you complete the 12th row of the last repeat, do another 5 rows of seed stitch like the first 5 rows, then bind off. Block it off and you gots a nice lace scarf! weeee! I'm sorry I only have a bad photo right now but I will update it in a bit! I'd usually say "all rights reserved" blabla if you make stuff from my original design don't sell it etc, but this pattern is so generic..so go ahead and sell it if you wish. But if you do sell it please mention AZURE and add a link to AZURE KNITS (http://knits.azure-m.com). Thanks! Thank you for sharing this pattern. It appears as though even a beginner knitter will be able to make it!! Your stitch count is off. 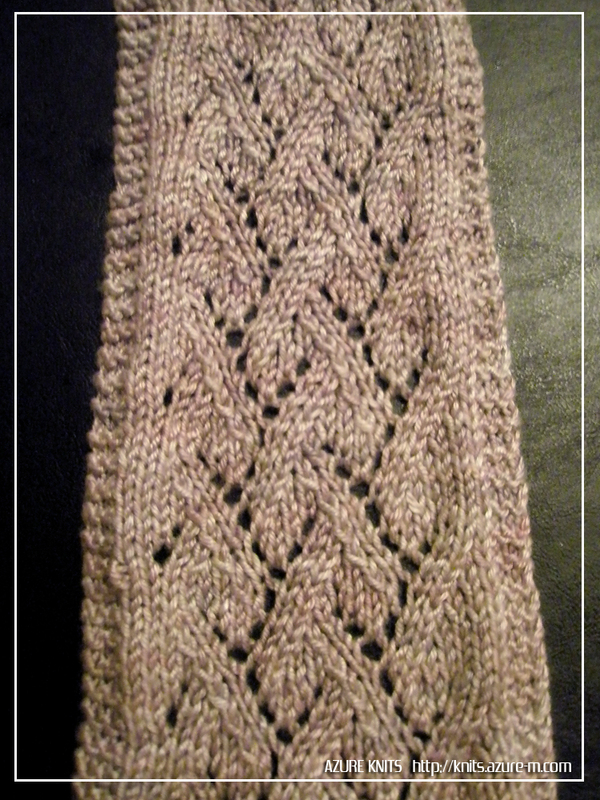 For row 1 of the lace pattern I only count 26 stitches. Row 3 is the same. One row is 27, another is 29. Could you please print the corrections? Hi phlubadub, thank you for your comment! For a lace pattern, it is very common to have different stitch count on each row. I also had times where I tried to count my way up and got confused since the number didn't match. Hi! First, thank you for the lovely pattern! Second, I have found no errors while making this scarf. For those who are having trouble, follow the pattern carefully and you will be fine. 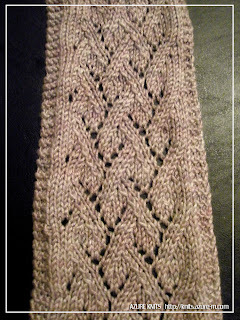 What a pretty pattern - I have a skein of Bonnie's Bamboo and this looks like the perfect pattern. I do have a question though - on the ravelry site, the pattern says to use 4.5 mm needles. But here it says 3.25 mm- which seems maybe too small for lace, but I know bamboo stretches a lot. Which size do you recommend? Hi! Thank you for your comments! Thank you too for your comment, and thank you for spotting the error! Thank you for this lovely pattern. This is the perfect introduction to lace knitting. That looks like a fantastic scarf. I've been looking for some good lace knitting patterns. Is this a pretty basic pattern? I'm kind of a beginner. SO SORRY FOR SUCH A DELAYED REPLY! This pattern is relatively easy and not extra complicated, but the stitch count varies row to row so I would say that there are much better option for a 'very beginner lace' scarf. This may be a good second beginner scarf. I understand why on the second row and on there can be different stitch counts but shouldn't the first row (besides the border) add up to 28 since that is how many were casted on? Thank you for sharing the pattern. I found the perfect yarn in my stash. Cannot wait to make it.